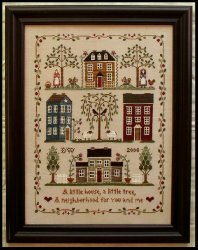 Little House Neighborhood SAL: Chart is in! I hadnt heard anything all week so I thought I would pop in to my LNS to see if it was in and I got lucky! I picked up all the DMC thread as charted and picked out Days Gone By 28ct Lugana for the fabric. But as luck would have it, the camara is at work with D so I will post a pic later. Cool! I haven't heard of that color linen, so would love to see a picture!